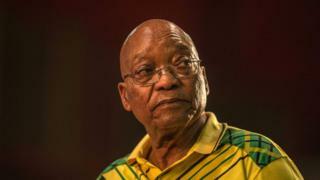 South Africa's Deputy President Cyril Ramaphosa say im dey siddon do face-to-face meeting with President Jacob Zuma on top how dem fit transfer power. Mr Ramaphosa na di oga of di ruling African Nationa Congress, ANC, talk say President Zuma understand say e dey important to settle di mata sharp-sharp. Im talk say di two men go conclude how oga Zuma future go be very soon. Dis na di first time e be like say Mr Zuma go step down. Di 75-year-old president don dey face plenty accusation tay-tay on top corruption for di nine years wey im don dey runs things for di country. Di Nelson Mandela Foundation foundation sef don tell am say make im resign.